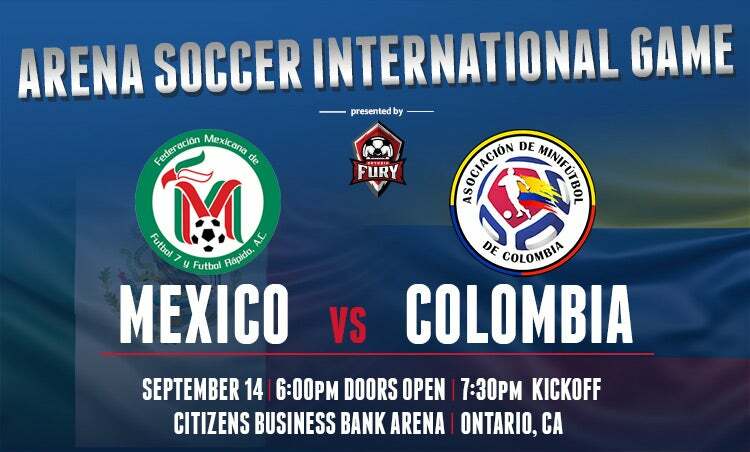 Citizens Business Bank Arena in Ontario will once again be the location of an Arena Soccer International Game at 7:30pm p.m. Friday, September 14, 2018 featuring the National Arena Soccer Teams of Mexico and Colombia, which will be hosted by the Ontario Fury. This game is the third of a series of International games hosted by the Ontario Fury at Citizens Business Bank Arena during the offseason this summer. Most recently Guatemala faced the Fury on April 20, 2018 and USA took on Mexico on June 1, 2018 in front of 6,236 fans in attendance. “This will be the first appearance for Colombia in Ontario and we are looking forward to welcoming them here. Mexico has played here many times before and draws great fans. I think this is shaping up to being a great game with two very exciting teams.” said Fury president Bernie Lilavois who also serves as GM of Team USA. Rosters for the game will be announced next week. Both Mexico and Colombia recently competed in the Delta Dental Arena Cup played at Centurylink Arena in Boise, Idaho this past August 17-18, 2018. Mexico lost in the tournament final to USA and Colombia finished in 3rd place after defeating Somalia. Tickets for the game, starting at $10, will go on sale the week of August 27th at the Citizens Business Bank Arena Box Office or online at Ticketmaster.com. Special group ticket packages are available through the Fury’s office by calling 909-457-0252 now. Season Memberships for the Ontario Fury’s 2018-19 season are also on sale now through the Fury’s office. Benefits include free parking for regular season games, invitations to exclusive season member events, discounts on merchandise and Ticket Exchange Program, to make sure tickets don’t go to waste. $20 fee for Busses, Limos or RVs.